big Ideas From A Little Girl: Finally, Color Renovation information! As you've been reading on fellow SU demonstrators' blogs, the new COLOR RENOVATION announcement was made and boy, was I excited! Mainly, because one of my all time favorite colors, Pink Pirouette, was making a come back and is one of the new colors added to our regular line of fabulous colors! 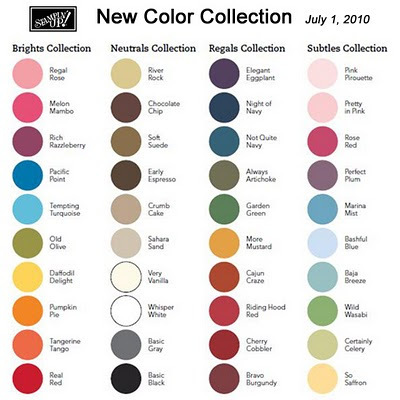 Here are the new color collections, available for purchase beginning July 1, 2010. How exciting is this? FYI, these are the colors that are brand spankin' new to the collection: Daffodil Delight (Brights), Early Expresso and Crumb Cake (formerly known as Kraft from the Neutrals), Cajun Craze and Cherry Cobbler (Regals) and Marina Mist (Subtles). FYI, these are the returning colors (most of them are from past "In Color" collections: Melon Mambo, Rich Razzleberry, Pacific Point, Tangerine Tango (Brights), River Rock, Soft Suede (Neutrals), Riding Hood Red (Regals) and Pink Pirouette, Baja Breeze, Wild Wasabi (Subtles). If you would like to download a color chart for yourself, click on the link on my sidebar. As exciting as it is with the new colors being released, it's also a sad time for some of our favorites as they will be retiring. 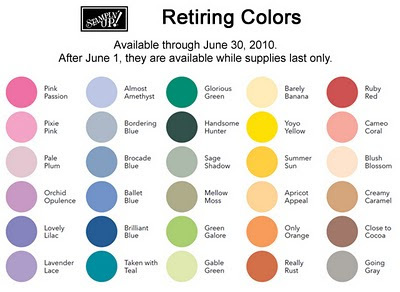 Here is the chart of the colors that will be retiring on June 30, 2010. Click on the link on my sidebar to download a copy of the retiring list for yourself. NOW is the time to place your order and stock up on your favorite colors that will be retiring. We were told that a color reorg will not be in the works for a while. Please stay tuned as I will be creating some cards with some of the new colors that SU has graciously given us a sample of some of the new colors. Thanks for patiently waiting for me to post the color renovation information. Funeral on Saturday, UH BaseB game on Sunday....BUMMERS!! Maybe I can cop out of the game???? I'll let you know. Thanks for sharing the new colors with us.